Tarheel: JtB's FreeMason,religious,Orion-ite AND likes 3 Mary's too. Sounds like he's our kinda guy. BUT, I thought Isis is/was a chic??? Bob Dylan, "I married Isis on the 1st day of May, but I could not hold on to HER very long." Tarheel: Picture looks more like Mona Lisa after smokin Golden Harvest. Yes, one must balance The Matriarchal with The Patriarchal in order to expand consciousness, so gender-LESS makes sense. bluesbaby5050: She's given the Finger! At WHAT? The sky? To the heavens,as in L00K AT THE UFO'S! 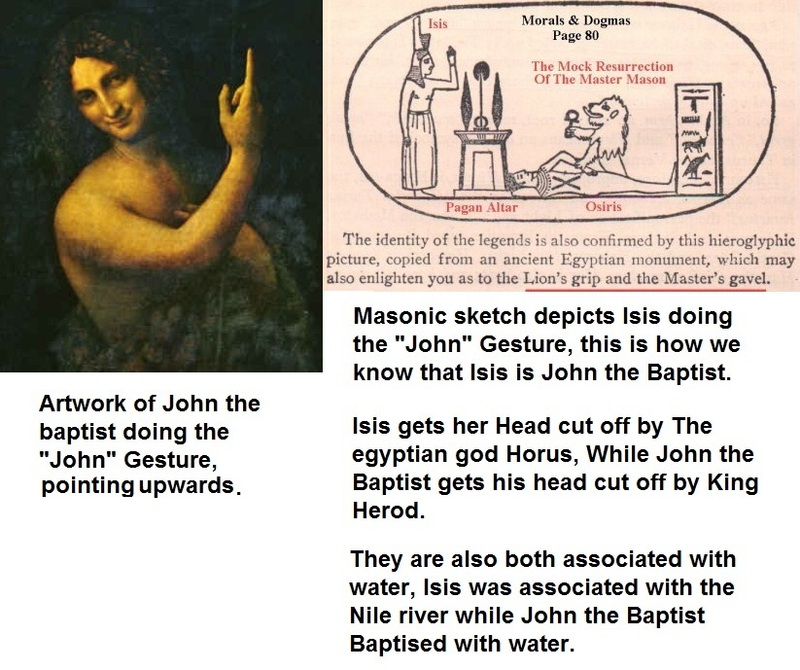 i think its more to do with the numerical value, the number one is related to the old babylonian god oannes (phonetically like John/jones a bit). oannes was half fish and half man, this is where the story of merpeople comes from. 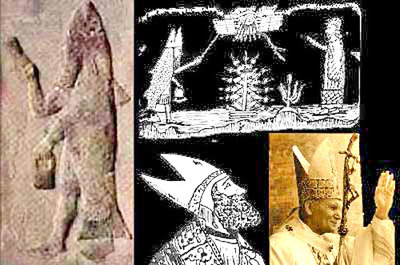 And the Pope's/ Priests hats are up-side down fishs too.As in the fish symbol. Tarheel: You TOTALLY missed the fish TAILS in your "mark up" TR. Very professional pensmanship, I might add. There isn't an ounce of proof in your post. For all we know ancient people made the drawings and stories for fun. Maybe they even made them just to screw with people in the future such as yourself. You people claim in your posts to 'question everything', but you don't. You simply DO NOT!!! And what proof do you have to offer? Tarheel: Dis-INFO agent at work. No proof? The proof is everywhere. But, I guess you could say nothing can be proved, BUT you'd be WRONG. We'd say you are credible but there's NO PROOF. Take it away, Doubting Thomas. Because they were way too busy living their lives in harsh time periods.They could be killed for what they said, and for what they wrote! Dying for a joke is NOT worth it. They aren't like people of today that would actually think of purposely doing this just for FUN, as You Say! And the people in this forum do their research before they would think of making dopey comments, such as this one for example. Just because a person hasn't experienced what another person has, does not mean it did not happen, or it does not exists. If people are intelligent, they will question things, and not take things at face value. You can NOT speak for everyone here as you just did, BECAUSE YOU DO NOT KNOW EVERYTHING YOURSELF. It's all around you. Globally all around you.